Batman: Arkham Knight certainly impressed us with its E3 2014 presence on the show floor and its accompanying trailer. It seems as good a time as any to talk about a much lesser talked about entry in the series, the one that appeared on both the Nintendo 3DS and the PlayStation Vita. 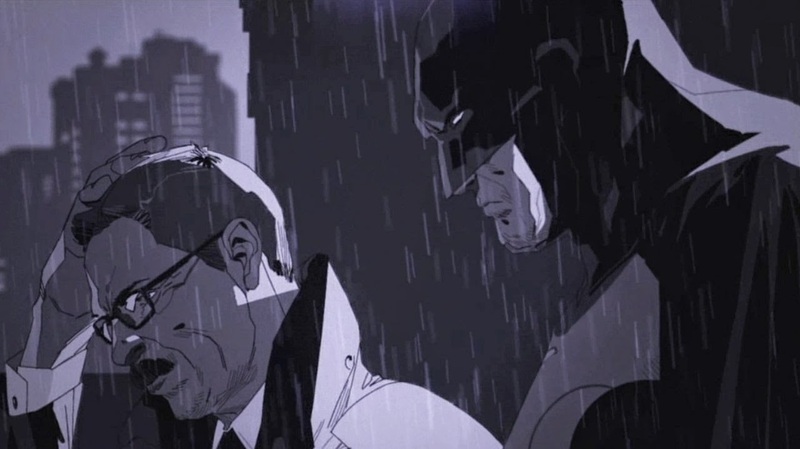 It's Batman: Arkham Origins Blackgate, and here is our review. Batman is set to make his eighth generation debut in a big blockbuster way with Batman: Arkham Knight. While that game might have slipped into 2015, the buzz for the game is still at a fever pitch, especially after a successful showing at last week's E3. This will mark developer Rocksteady's third go at it with the Batman license and the fourth console game in the Arkham series. Meanwhile, Armature Studio, made up of talent of former Retro Studios employees, created and launched the Arkham series's first foray on handhelds late last year with Batman: Arkham Origins Blackgate for both the Nintendo 3DS and PlayStation Vita. Is being the bat on the small screen all it is cracked up to be, or will the experience drive you batty? 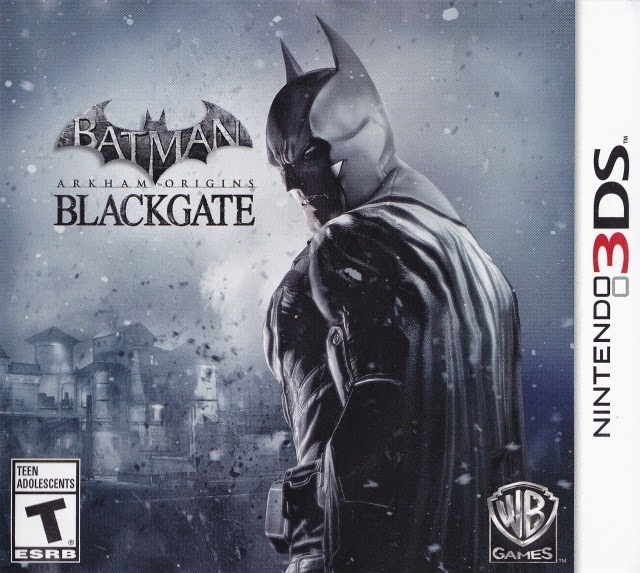 Blackgate the game's story happens three months after the events of Batman: Arkham Origins. Three of the most violent and vicious criminals in Gotham City, The Joker, The Penguin, and Black Mask, reside in Blackgate Prison, each with long-term residencies. When an explosion goes off within the prison, the three criminals take the opportunity to scrounge up their own set of henchmen and occupy one of three major areas of Blackgate. Batman goes in to make things right, all the while uncovering that the prison explosion has more than meets the eye to it. give some zing to the presentation of Blackgate's story. Blackgate's tale is told successfully through hand-drawn comic panels with the bonus of included voice acting to add some more dimension to things. Blackgate contains a story that won't blow the minds of players, but it will keep them playing along until the very end of the 10-12 hour campaign. Batman: Arkham Origins Blackgate plays similarly to Metroid, although Blackgate contains a fleshed out 2.5D perspective that does a lot to impress. However, it also does a lot to detract from the experience due to its less than stellar execution. A main issue with traversal through Blackgate's environments concerns the in-game map. 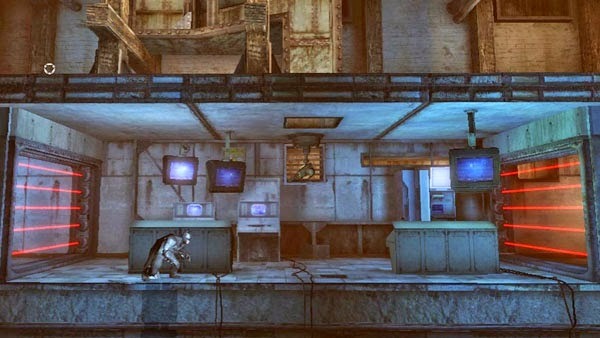 The actual game world features rooms and hallways that cross over one another, sometimes having Batman move into a room that isn't just to the left or right as is typical of a 2D game but actually in the background. The map Blackgate uses does not account for any of these variables. This makes it all too easy to become confused and frustrated as to which way you need to go. It may seem you're in the correct room, but since the map is presented in an overhead perspective, you might be several floors above the room you need to be in. A 3D map a la Metroid Prime would have been a much better solution for players to avoid any kind of confusion. don't have a fantastic view of the action. Then there's Blackgate itself. Being set in a prison, one would not expect a bright color pallet for the art direction of the game. This is particularly true with Blackgate, as there are tons of subdued color choices, drab, dull, and uninteresting rooms and hallways to move through. The visual variety presented is seriously lacking, and this is only compounded by the tedious amounts of backtracking involved in Batman: Arkham Origins Blackgate. Enemies do not return once they have been defeated, so Batman is basically running through empty chambers with the occasional need to use one of his bat gadgets to progress. That said, the actual game world of Batman: Arkham Origins Blackgate is expertly designed, as one would expect from former Retro Studios staffers. The amount of well placed hidden secrets, such as costume parts, health upgrades, and other goodies, makes for a game that possesses some admirable replay value and longevity. As for enemy encounters, these have made a successful transition from Blackgate's big console brothers. 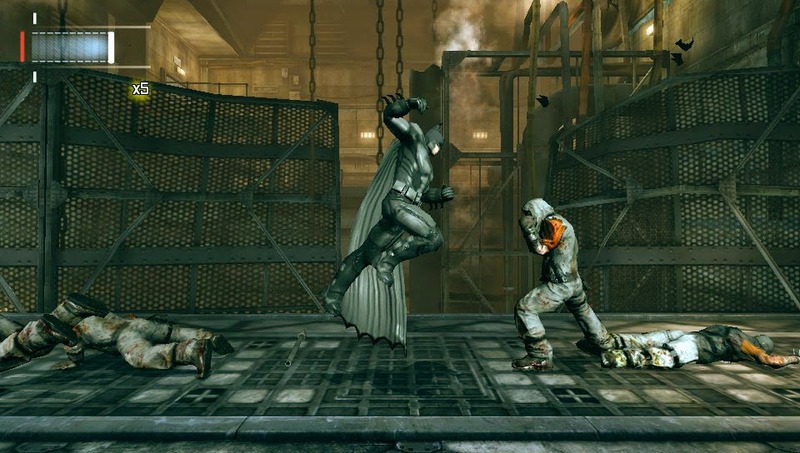 These battles still occur in Blackgate's 2D gameplay plane, but Batman automatically moves between the foreground and background as he pulverizes foes. The free flowing combat allows players to effortlessly string together high combo totals just like the console games, albeit in a much simpler form. There's still opportunities for enemies to get shots in, but precise timing of the counter button allows Batman to save his hide from injury. but Batman's going for the slam dunk. 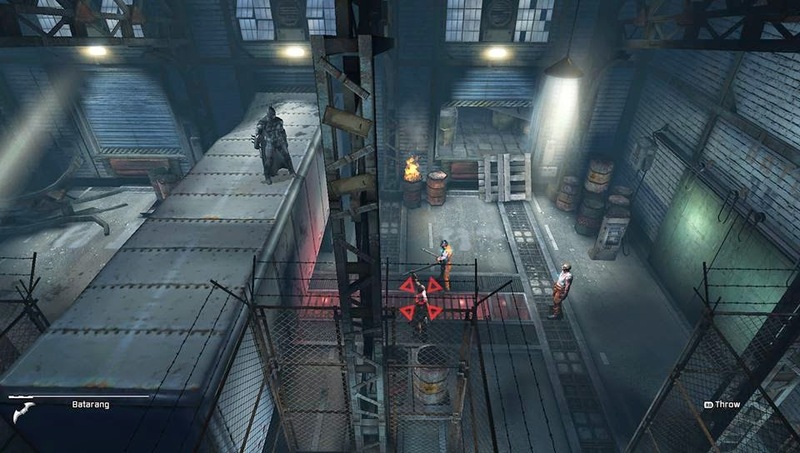 The game features multiple boss encounters, and unlike many other games of its type, Batman: Arkham Origins Blackgate allows the player to choose which of the three main bosses to attempt to tackle and take down first, as each controls one third of Blackgate Prison. The boss fights are relatively clever in their design, offering more of a puzzle element to them than straight up waiting for an opening and then mashing buttons. For instance, the Joker battle is set in a circular arena, where Batman must use the Line Launcher gadget to cut across the middle of the arena to run into the seemingly always retreating killer clown. With the proper timing, Batman's feet connect with Joker's wicked mug. Stealth plays a notable factor in Blackgate. Batman's arsenal isn't limited to his fists and feet, however. The dark knight isn't known as a superhero simply because of his massive intellect and skills of deduction. No, he also has a slew of supporting gadgets to assist him throughout his objective. 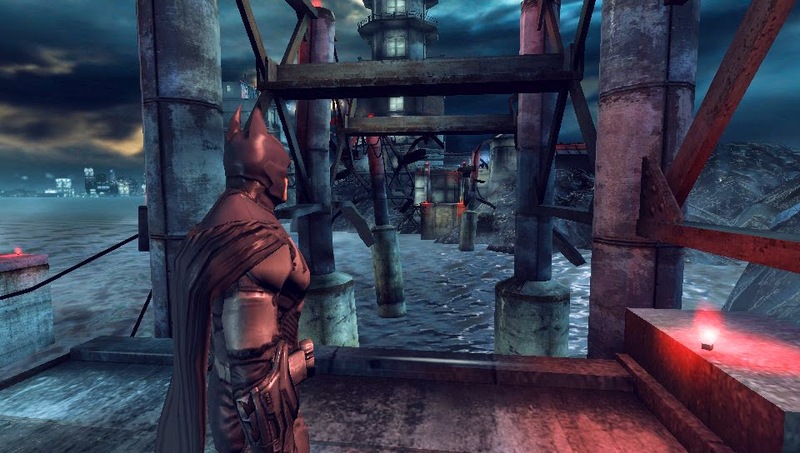 Like any good Metroid-styled title, Batman comes across new gadgets and abilities to allow him access to new areas within the linked-together game world. 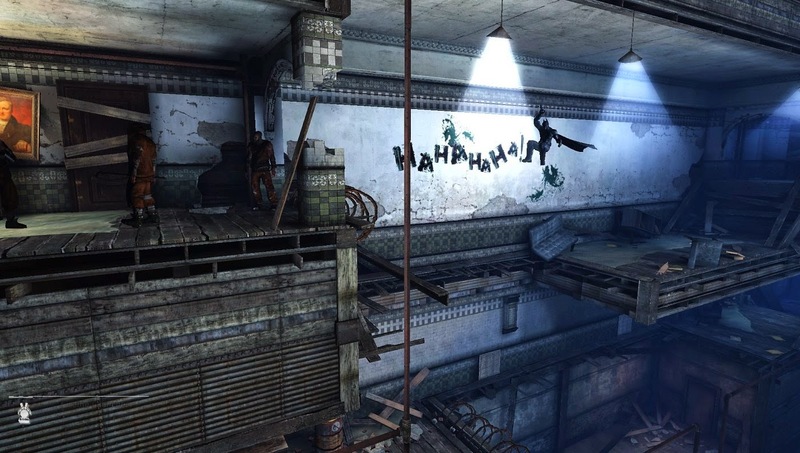 Since Batman is unable to jump within Blackgate, his grappling hook is used to reach higher destinations. Batman can pull weakened walls down with his Batclaw, and some Explosive Gel is perfect for destroying obstacles in his way. Need to cross this huge gap? Bring on the Line Launcher! 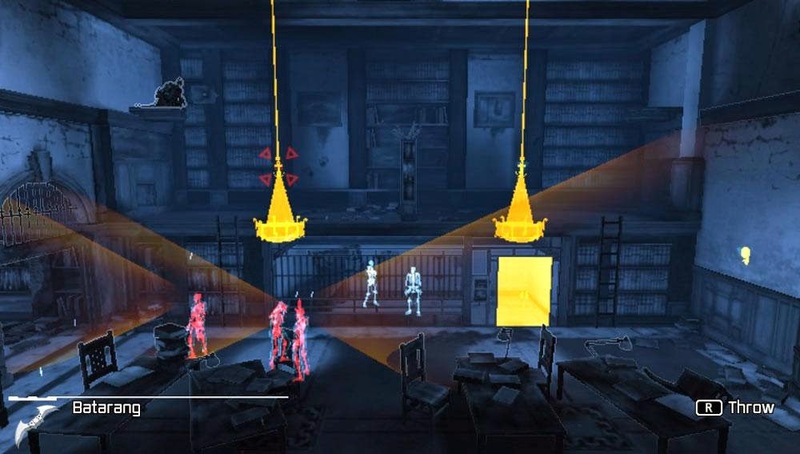 The Arkham series's trademark Detective Mode returns in Blackgate, allowing players to scan and identify notable objects in the environment. Nonetheless, this is much more of a hassle and nuisance rather than being rewarding and enjoyable. Various interactive environment obstacles are strewn about the confines of Blackgate Prison. These must be scanned in Detective Mode before they can be interacted with, so that means that even if the obstacle is incredibly obvious as something that can be manipulated by Batman, he must still scan it. This constant scanning of areas brings the pace of play to a screeching halt at times. Batman: Arkham Origins Blackgate is a novel approach in transitioning the gameplay of the Arkham series from home consoles and creating a small-screen experience that works well overall. A poor map and a lot of repetitive visual design brews up some annoyances, but all in all, Batman: Arkham Origins Blackgate swoops onto the Nintendo 3DS and PlayStation Vita systems with a lot of style and a fair amount of substance to back it up.